Dortmund - A nasty glance here, a condescending gesture there - nothing too out of the ordinary for two competitive rivals, although one got the feeling things were about to boil over between Borussia Dortmund and FC Bayern Munich last Saturday. The 63rd minute arrived in the battle of the Bundesliga giants and the emotions broke loose. If it was not already clear, there was no mistaking that there was more at stake than league points for Germany’s best two clubs, and there will be even more riding on their next meeting in the UEFA Champions League final at Wembley in three weeks’ time. “I wasn’t looking to make new friends,” said Dortmund’s coach Jürgen Klopp. A phrase which succinctly summed everything up; a description of his touchline altercation with Bayern’s sporting director Matthias Sammer which expressed the general feeling of many inside the Signal Iduna Park, from the players on the field to the staff off it, and to the fans in the stands. There is no love lost between these two clubs, and in days like these, those emotions are becoming increasingly palpable. Yet the action on the field was relatively tame compared with the relentless mutual jibing on the terraces. That was, of course, until the temperature started to grow within the pressure cooker. Although Kevin Großkreutz was keen to share his joy at scoring with his own team mates, he could not hide a menacing glance towards the Bayern fans as he reeled away in celebration. The look said it all: ‘We’re a match for you’. And Dortmund’s domestic five-game unbeaten streak against Bayern backed up his argument. exchanged pleasantries with , who in turn discussed with ; had words for - everybody had something to say. Even Sammer got involved. and did not appear to be exchanging compliments when they met, heads an inch apart, and Julian Schieber did not hold back against Neuer. “It was really spicy,” said Klopp as the challenges went borderline or, in the case of Rafinha’s elbow, beyond. "This game will never be a friendly,“ said Neuer afterwards. There is no longer any doubting that. More than just superiority in German football is on the line: it is all about prestige, and of course titles. That will be the case on 25 May when both teams meet again in the Champions League final, vying for European football most prestigious trophy. “The aggression was a taste of what’s to come at Wembley,” said Dortmund goalkeeper . In view of this Bundesliga clash, no gifts can be expected on Europe’s biggest stage. “We've really annoyed Bayern in the past ten years,” said Dortmund captain . “This year, they're having an amazing season once again, but there are going to be more people rooting for Borussia Dortmund in the Champions League final." Not so according to Bayern’s chairman Karl-Heinz Rummenigge. “Dortmund seem to struggle to beat Bayern - this was already the fourth game in a row they have failed to beat us,” he said, including the Supercup and the DFB Cup in his calculations. Statistics are always open for interpretation, but all Bayern coach Jupp Heynckes cares about is the end product and not the sideshows. 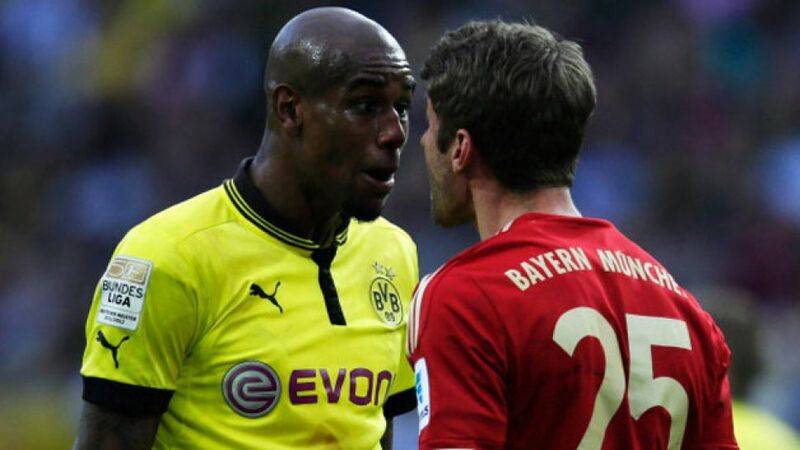 “I don’t take notice of anything which goes on off the field," he said, dismissing even Sammer’s clash with Klopp. Words of wisdom followed by a warm embrace with Klopp at full time. Warmth which could get fiery at Wembley.